It's Cricket World Cup season and you are stuck at office. What do you do? Well, i personally wouldn't go to office in the first place during an India match. But, I usually avail these free servicees to stay updated of live scores, ball by ball commentary and results. ESPN Android and iOS application is a treasure trove if you're fond of sports . It is the official application coming from the prestegious prestigious chain of ESPN television network. It offers detailed and thorough information on all major sports including Cricket, Soccer, Basketball, e.t.c. as well as some minor sporting leagues. With many videos and news that are updated hourly, you can follow live action without any hassle. 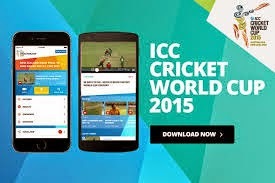 In my opinion, it is one of the best choices for watching ICC Cricket World Cup 2015. Cricinfo is a dedicated website and network completely focused on Cricket. It has a wide presence in India and not to mention, it also comes from the line of ESPN. It is one of the best platforms to stay connected with live updates of Cricket World Cup as it is one of the official partners of ICC along with Cricbuzz. If it is banned by your network, you can check out cricinfoscores.com for an alternative. This is one of the underrated websites in India. I'm not talking about the ratings, it is poorly marketed because most of the people aren't aware of it's website. As you might be aware, it is the only network offering Live telecast of all World Cup matches in TV. What you might not know is that it is also offering Live streaming on it's website for free. Thank you for reading. Hope you find this information helpful.